Well that was quick! After debating and deciding if I wanted a Kindle Fire or Nook Tablet(s bks), I pre-ordered Amazon’s(s amzn) tablet just two days ago, and it arrived at my home office Tuesday during lunch. 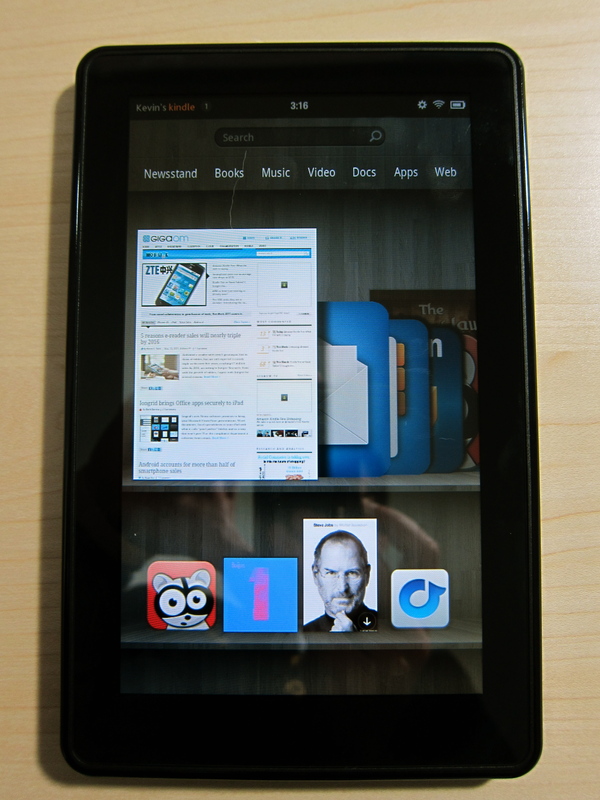 On Monday, we showed off the Kindle Fire on video so you can see what the device looks like for yourself. Now that I have a Kindle Fire in-hand, I’ve wasted no time in playing with it, albeit for only 30 minutes. Still, that gives me plenty of first impressions to share on the hardware, software, features and user experience. The out-of-box experience is pretty solid, since the Fire comes pre-registered to your Amazon account. There were only a few settings to deal with: Wi-Fi connection, time zone, etc. However, there was an immediate software update once past the settings, so it took a good five minutes before I could use the Fire. Without the software update, it would have been usable in under a minute. Because the device is pre-registered, all my prior Amazon content is there — sorta. Music albums stored with Amazon appear in the Music section, and I was able to immediately start streaming or downloading them. My archived Kindle library was there, but none of the books were pre-downloaded. One tap and a few seconds later though, I picked up a Kindle book where I left off reading last night. I have a few dozen apps from Amazon’s AppStore, and shortcuts to all of them appear in the Apps section, but they all need to be downloaded, as evidenced by a small down arrow on each icon. The Fire’s overall hardware appears well-built, but plain. It’s extremely similar in size and weight to my Samsung Galaxy Tab, although it’s slightly thinner. Since I can carry my Tab in a jacket pocket or back pants pocket, I should have no problem doing the same with the Fire if I need to. 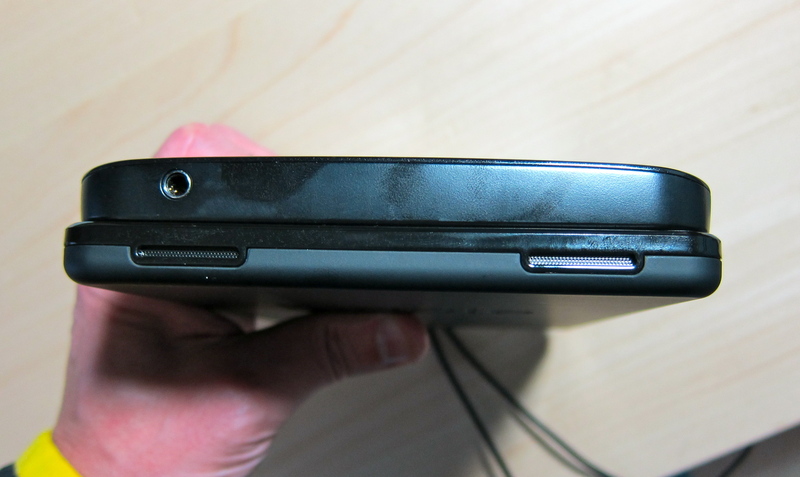 Unlike my Galaxy Tab, the back of the Fire has a nice, light “grippy” feel. The speakers are mediocre; you’ll want to use headphones, which aren’t included. The email client is basic but will suffice for most people. You can use Gmail (s goog) labels by tapping the Move button on an email, although these are really folders on the Fire. 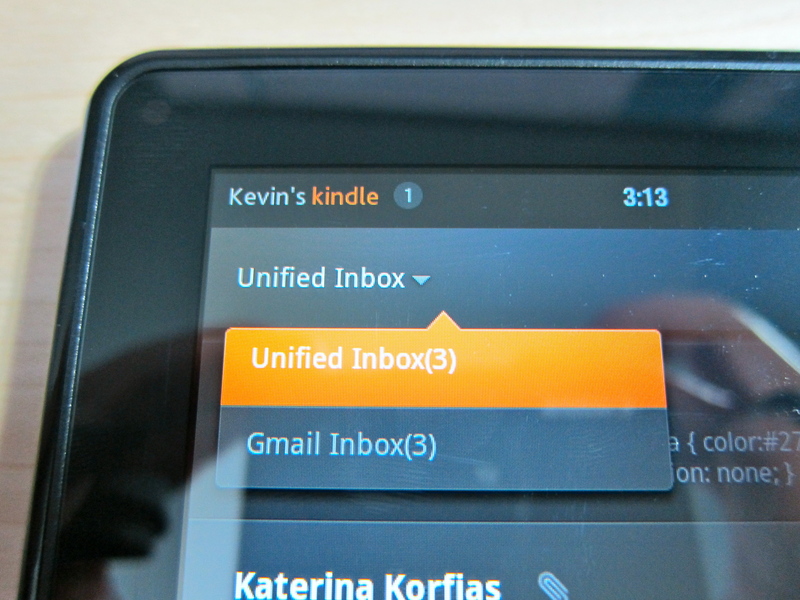 There is support for a Unified Inbox if you have multiple email accounts. Although not superb, the keyboard isn’t bad, and it does have an auto-suggest option. I wish the space bar wasn’t offset, but I’m already getting used to it. I don’t like how Amazon’s AppStore doesn’t have the official Facebook client. Instead, the Fire uses the mobile version of Facebook in the browser. Navigating through the carousel of books, music, apps and such is easy — similar to Apple’s(s aapl) Cover Flow — but the kinetic scrolling is too sensitive. That needs some software tweaking to make it easier to choose an activity. I wish there was a hardware button for volume control, but it’s only one tap away in the top right of the screen. There are actually several settings available from this single tap, but Amazon smartly defaults you to the Volume setting each time you tap this button. There are fewer settings available to tweak than on a traditional Android device: Good for first time Android or tablet users. In the Security setting, there’s a section for Device Administrators, suggesting the Fire can be “locked down” to certain activities before handing it over to the kids. Unfortunately, there’s no way to modify this setting area. Lack of a dedicated hardware home button isn’t really a problem — at least not for me. A software home button (as well as a back button) is readily available on the bottom of every screen as needed. The Notification system is similar to standard Android device, but you don’t pull down a shade. Instead, when notifications come in, a numerical counter at the top left of the display is incremented. Tap the number to see the notifications. 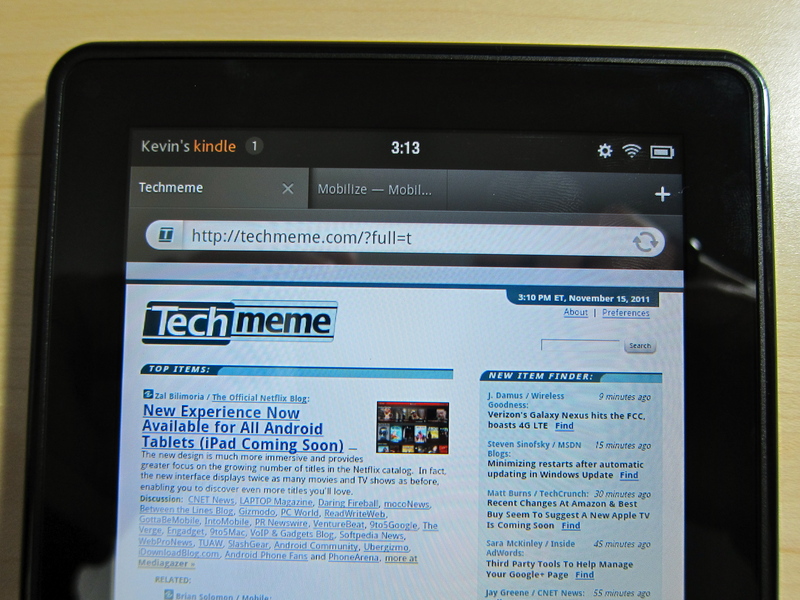 The browser may be customized by Amazon, but it looks like a bare-bones Android browser with similar controls. However, it does have true tabbed browsing. It doesn’t seem any faster to me by way of Amazon Silk, but it’s too early to say. Sharing web content is simple, as it is on all Android devices: Tap “share” and you’re provided with options for any sharing apps you have installed; I installed Seesmic, for example, and the Fire will let me share content through it. Video playback wasn’t good at first, but appears to have been related to the content I was viewing: Our video unboxing of the Kindle, which wasn’t mobile-optimized. However, previewing movies and TV shows from Amazon over Wi-Fi showed excellent playback. Overall, performance of the device isn’t quite as good as I had expected for a dual-core processor. However, I’ve seen performance boosts from software updates on prior phones and tablets, so I anticipate Amazon will keep tweaking the Fire’s software. Even if they don’t, the device is quite usable. Running multiple apps doesn’t seem to hinder the device, although I haven’t run dozens at the same time. I was streaming music through Rdio and reading a book while downloading some local music files and browsing the web: No problem. That’s a whirlwind of my first impressions after just a half-hour with the device. I can’t speak to the battery life claims yet, of course. The Fire did come with about 70 percent of a battery charge, which is appreciated. There’s nothing worse than getting a new gadget and then having to wait for it to charge. So far, I think many people will find the Fire worth the $199 price-tag, because it offers a simple way to enjoy Amazon’s media on the go, for a relatively small investment as compared to a full-fledged tablet computer. If you have questions about the device, post them in the comments and I’ll do my best to get you answers. The bottom-mounted power button is too easy to press while resting the tablet. Agreed, I’d would have rather seen it atop the Fire or on one of the sides near the top; away from where you’d be holding the device. I’ve put the Fire in sleep mode a handful of times accidentally because of the button placement. thank you for first immpresions. but this information are not that useful as you think they are. yes Kevin, really. tell us what we dont know about this device. withvwhile respect, almost the same info I can get from amazon :) Go further, beyond amazon aps funcionality. Point is, can we get full funcional android device for 199 ? or maybe half funcional? what works what not ? skype ? what video formats support ? Thanks for sharing your impressions, Kevin. 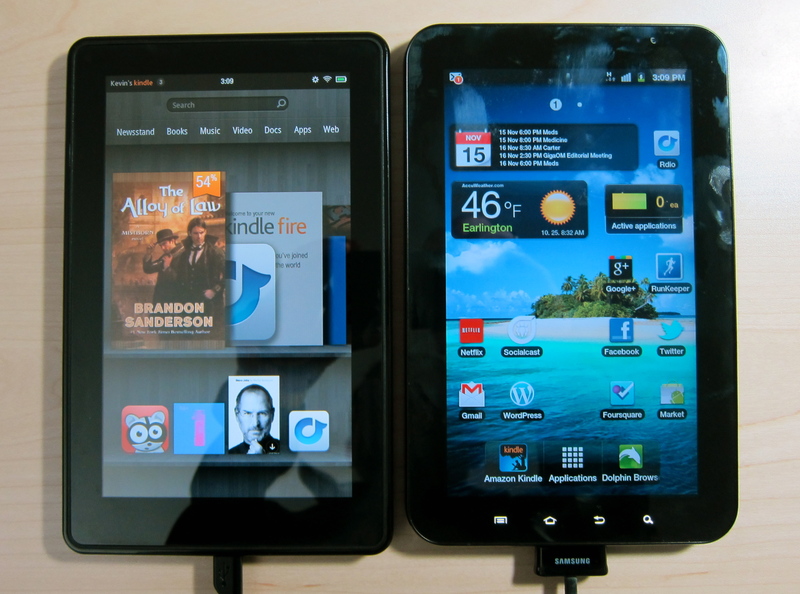 I have also been trying to decide between the Nook Tablet (or even the Nook Color) and the Kindle Fire, so I am curious to know what made you decide on the Fire and are you happy with your choice so far? I like the device for what it can do, although I’d like to see a few small gaps addressed. I may yet return it and keep my Galaxy Tab, but not because the Fire is a bad product, but because I can do most of the same things (and more) with the Tab. We’ll see! Thanks for the info and link, Kevin. I am going to check it out. So when you say it is pre-registered with your Amazon acct, does it allow you to make purchases and such without having to enter your username and password? Yes, you (or anyone else) can make purchases for content right out of the box, just as you have been able to do with Kindles for years. Physical goods from the Amazon store require a password. Really? I shared a ton of immediate information after 30 minutes with the Fire that’s usable for the device’s intended audience and that’s too “obvious”? Sheesh! Kevin, maybe Amazon Silk doesn’t seem any faster to you because you have FIOS, and you would essentially be wasting time sending data to amazon’s servers and back. ;) I wish I had FIOS. Wait. You ordered yours two days ago and got it already? I pre-ordered mine weeks ago and still don’t have it. First come first-served. PSHAW, I say! Do you have to just have access to wifi to use the fire? Or is it like the IPad that you have to buy a monthly data package in order to get internet access? TG, the Fire only has a WiFi radio for connectivity, no 3G radio, so it’s not possible to buy a monthly data plan, nor is there any need for one. I don’t see any reference to having a membership in the Amazon Prime program and how it allows one to ‘borrow’ books for free. Don, I found the option in the Kindle store on the Fire. Not a ton of titles just yet. Any thoughts between this and the Galaxy Tab 7 Plus? Richard, I don’t have a Galaxy Tab 7 Plus to review yet (I do have the old Galaxy Tab), but I find Samsung’s new tablet to be priced too high in comparison. It costs $399 for the 16 GB Wi-Fi version, so you get double the storage and can expand it further. You get a mic and two cameras as well. But I’m not a fan of the Honeycomb interface, which is what Samsung will be using on it. Maybe after it sees Android 4.0, I’ll like it better. Also, I’d say these two tablets are aimed at different audiences. Tech savvy folks that want to do their own thing with Android will be happier with the Tab while the mainstream consumers looking for a consumer electronics / simple to use device are likely to gravitate towards the Fire (or Nook). Just my early opinion, given that I haven’t used the Tab 7.0 Plus yet. I’m curious to see if movies I’ve ripped will work on it. 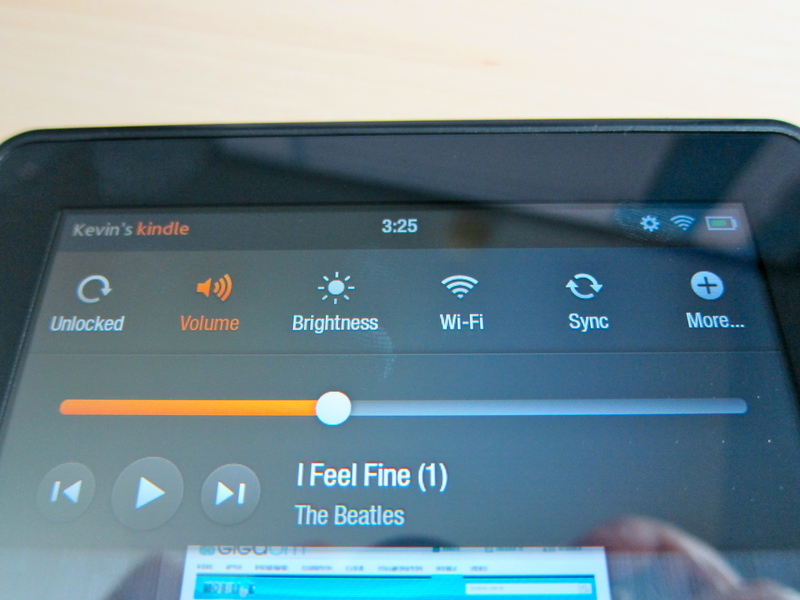 Do you know if Amazon Prime is activated once you sign in to the Kindle Fire? Regarding the software update, do you know if that was a planned update or something they wanted to fix quickly? Clay, what movie format are you wondering about? Maybe I can rip a video and try. I already have Amazon Prime so I don’t see any difference in my account status. I suspect new Fire owners immediately start their Prime trial once the tablet is first up and running. I’m betting the software update probably won’tbe an issue after the initial batch of Fires are shipped. No idea why it was needed. The Amazon Prime activated for me instantly. I never opted in to start it or anything that I remember. I think it was pre-loaded, I got an email as soon as I unboxed it and started playing with it. I haven’t read all the comments yet but it doesn’t come with a data cable like the older Kindles, you have to buy one. I had an old one but you should add the price of a cable to the cost of the Fire. I realize most people won’t do this, but presumably you can just grab the Facebook apk and install it once you enable 3rd party apps. I’ll be very interested to see your full review, I finally let my Galaxy Tab go a couple weeks ago and am seriously considering the Fire. Sean, you’re absolutely right on all counts. Installing the .apk shouldn’t be a problem if you know where to get it from and you check the setting to allow side-loaded apps. I think the vast majority of Amazon’s target audience won’t do this, but chances are they won’t have to. I expect the missing apps to be in the AppStore soon. Thanks! Got mine today as well. Where are the Netflix, Twitter, & Facebook apps? Agreed Gabe! I know we heard last week that Netflix would be pre-installed, but it’s not there. Since this is such a cloud-based device, I anticipate we see the promised apps soon in a small over the air update. I just downloaded the Netflix App from the App Store and it worked fine- maybe they decided not to pre-install it?